...the most perfect indigo skinnies from Feather & Stitch! My month of international travel (slight exaggeration) begins with a mother & son trip to visit my good friend in Dusseldorf. She moved there from Belfast last August and my son has missed her 4 boys hugely. So for his birthday present, way back in October, we booked a May Bank Holiday trip and I can't believe it's here at last! When I'm doing a capsule wardrobe for a teeny tiny suitcase, there are a few key considerations. First up, I decide on the base outfit colour - the one that will run through everything I wear. It's usually either grey, black or navy and for this trip, I've decided on navy (and have even had my nails painted to match!!). Once I know that colour, my second decision is which coat to wear. Key for packing lightly - only ever bring one coat or jacket with you and make sure it matches all your outfits. If you need to bring two, then layer them to save on suitcase space - e.g. a jacket under a coat - so for this trip, I'm wearing my Heatons trench coat and I'm going to layer it with my M&S denim jacket underneath (though I've not worn the denim jacket for these photos). Next, I pick the one pair of jeans that will work with everything in my suitcase. Jeans are heavy and bulky and there is simply no need to bring more than one pair on a weekend trip. 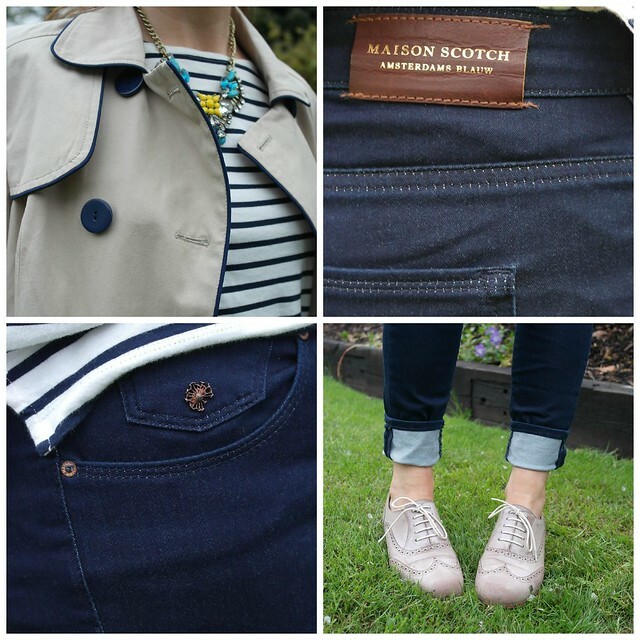 This weekend, I'm working all my outfits around these fabulous Maison Scotch indigo skinnies from Feather & Stitch. I don't have a big budget for clothes but there are a couple of items of clothing I'll always pay more for. Jeans are one of these and Maison Scotch are my most favourite brand. I think it's the fit - they just work on me and I have 4 pairs now. Every one of them is a size 29 and they all fit me equally well. They never need a belt, the denim is beautifully soft and they wash and wear so well. These indigo skinnies will work as well in the evening as they do during the day and I can wear them turned up as I have done here with the brogues, or full length with an ankle boot or heel. And speaking of footwear, no more than 2 pairs for a weekend away is my rule. I wear over something comfy for walking in - I'm currently dithering between these Clarks brogues and my Onitsuka trainers - and I'm also bringing some flat sandals in the hope of some sunshine. What else is in my suitcase I hear you ask? Well, I've got one pair of lightweight cropped trousers, a cream top, a white boho top, two vests and my navy Boden cross body.....and about 40 bars of Cadbury's chocolate as that's all my friend is missing from Ireland! Another weekend away tip - bring stuff on the outward journey that you won't have to bring home with you - so you've room to shop! I've got a pair of Birkenstocks on my shopping list...watch this space and keep an eye on Facebook & Instagram to see each day's outfit...and how the fugly shoe shopping goes! Perfect travelling outfit! Some great tips too, I always take far too much! And how fantastic are those brogues? Oh wow those jeans look GREAT and I am so in love with those Clarks brogues. Have a fun trip in Germany and thank you for the tips on a capsule wardrobe which in theory (to me) sounds great but I am RUBBISH at packing lightly! I'm also considering a pair of Birkenstocks but I can't decide if they are just too ugly. Can I pull them off? Will be interested to see how you get on with them. Enjoy your trip! Great brogues Avril....they look fab with the jeans:) Enjoy the trip with your son! Some great tips Avril for capsule packing & I love your jeans. Hope you have a fab time.